Being of very light weight, GEMINI ZAPCATS can be easily carried by two people and can be launched & recovered by 1 person. The GEMINI ZAPCAT FF-15 is a fantastic racing boat and guarantees you hours of exhilarating fun! 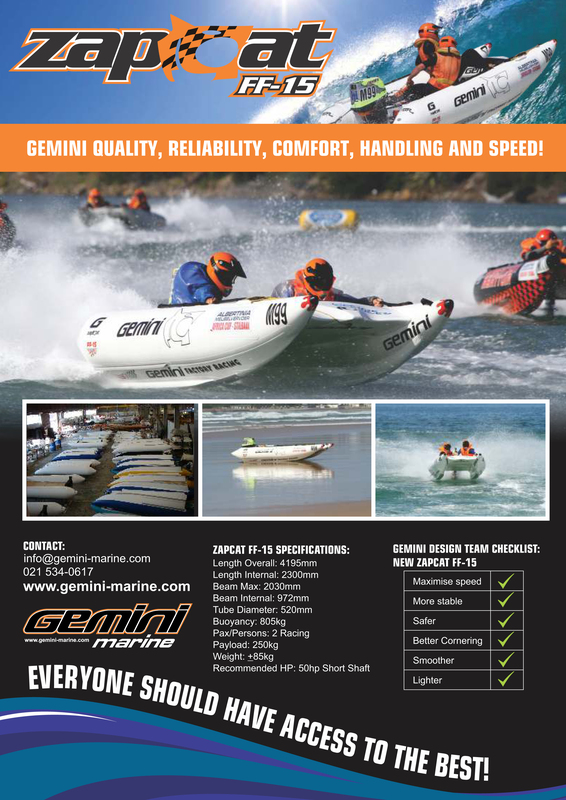 Pingback: BRAND NEW STOCK FOR IBR: All new FF-15 by Gemini | IBR | Bringing Inflatable Boat Racing to the U.S.A.
Is it any chance tha you guys can send it to Norway if i order one? Off course i pay the extra expenses. What will the total price be on the package if so? We can ship anywhere! I will be in touch with you to get specifics and we can go from there. Thank you for your interest. It’s good to hear from you again. The Gemini FF-15 is $5,595. The new Gemini F-1 was just released to the public last month and the cost is $5,695. Are you still interested in a Gemini FF-15? The transom can be closed and yes then you can install the “duck beaks”. I’m looking foward to buy a zapcat gemini ff-15, looking at your website interests me, but I would like to know buying one via online payment from United Arab Emarites is possible? How am I going to recieve it with a shipment? Can I know every detail and how everything works? Please inform me by sending me an email back as soon as you recieve my comment. Thank you for your interest in our company. When you order a boat from us, you have the option to choose the colors of your boat, choosing from the color chart available. You will then deposit the money in our bank account and once the money cleared, we will have your boat built and sent to you directly. We will need your physical address where the boat needs to be delivered, in order to get you an exact shipping price. All merchandise must be paid in full prior to it being shipped. Please let us know if we can help you with anything. We shall forward you all the documents, including the color chart so that you can make your selection. Just let us know when you would like to proceed and then we can set the process in motion. What is considered a standard hull in the way of colour scheme in FF-15 and are they in stock. There is no “standard” color scheme. You can select from a variety of colours, black, white, blue, grey, orange, red, yellow or a combination of these colors. The nosecone comes in black or white, however, if you wanted a different color nosecone, there will be an additional fee. 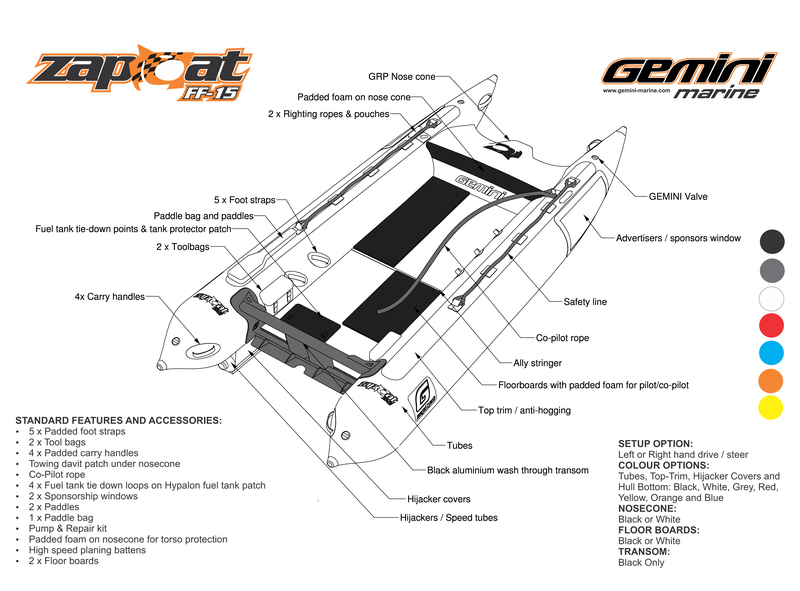 I am interested to order your boat, Gemini Zapcat FF-15 and for delivery to Brunei Darussalam. Does the price include the 50hp Engine? No the engine is not included in the price. How much in total to ship to Norway? Just wondering if yous do full package deals. Or what it would cost me to get it on water. Yes, we certainly can do a package deal. Give us a call at (603) 913-1683. What would the price be with and with out a outboard. Hello i am in Greece I am interesting for the FF-15. Can you please inform me about the price and the availability. Please contact us at inflatableboatracing@gmail.com or call us at 603-913-1683 and then we can determine which boat will be best suited for you. Might be being stupid here, but how much are you selling them for? The new Gemini FF-15 sells for $5,695, the Ceasar F-10 sells for $5,395 and the Infanta P-1 sells for $5,495. We also have one demo FF-15 for sale – $4,999 and 2 used boats for $4,395 each. We recommend that you keep the boat inflated and on the trailer year round. Please make sure that you let some air out (not too much though) when the boat is not in the water or being used. Please read the instructions to protect your boat. If you have any questions, please do not hesitate to contact us at inflatableboatracing@gmail. com or call us at 603-913-1683.